Godai-Rikison Ninno-e festival was held at Daigo temple on February 23th. 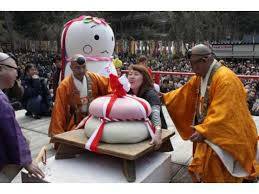 It is a popular event for lifting huge rice cakes to pray for their health. Every year, some visitors, both of men and women, participated in the rice cake lifting and they pray for their own health in this year. In addition to that, Diago temple is surrounded with rich green and a lots of cherry blossom trees, these landscape made me relax and comfortable. Please feel and absorb an energy coming from those who challenge the huge rice cake lifting in Daigo temple. Just 10 min by bus from our share house!